Pocket-sized and light, this bright solar lamp gives hours of light to you and power to those who lack it. Bring a little piece of sunshine wherever you go. No, we don't mean your bubbly personality (that's a given). We're talking solar-powered light. 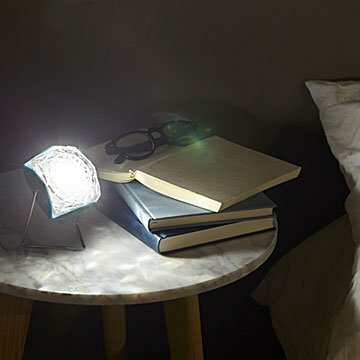 artist Olafur Eliasson and engineer Frederik Ottesen's pocket-sized, featherweight lamp radiates a sparkling glow, thanks to its faceted, jewel-like lens. The built-in stand makes it a great reading or bedside lamp. Exchange it for a lanyard and take it camping. From five hours of charging in the sun, you get five hours of bright light, then some long-lasting soft light. Best of all, your purchase helps fellow B Corp Little Sun (Olafur and Frederik's company) to offer them to villages without affordable electricity. Help spread the sunshine. Designed in Germany. Made in China. Charge for a minimum of 5 hours in the sun gives you 5 hours of bright light, fading to long-lasting soft light.